Kermans Flooring - a premier Indianapolis Flooring store - gives away a full size area rug each month, valued at up to $1,700. Our store selected another lucky recipient for April: Barb Arnold from Noblesville, Indiana. Barb's name was randomly selected from our website entries. 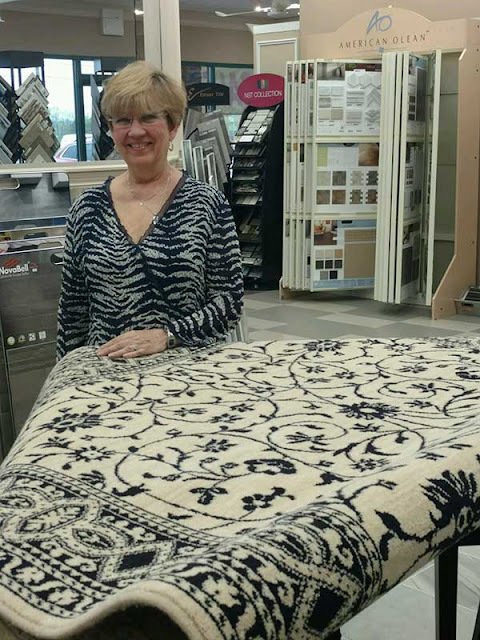 For her winning rug, she selected a patterned black and cream area rug that she will be using in her dining room. Will you be next? Enter for a chance to win in our monthly area rug giveaway. Looking for inspiration? Check our our Area Rug Pinterest board for ideas and the latest rug styles. Visit the Kermans website for more information or schedule a free design consultation to talk to one of our flooring design consultants.